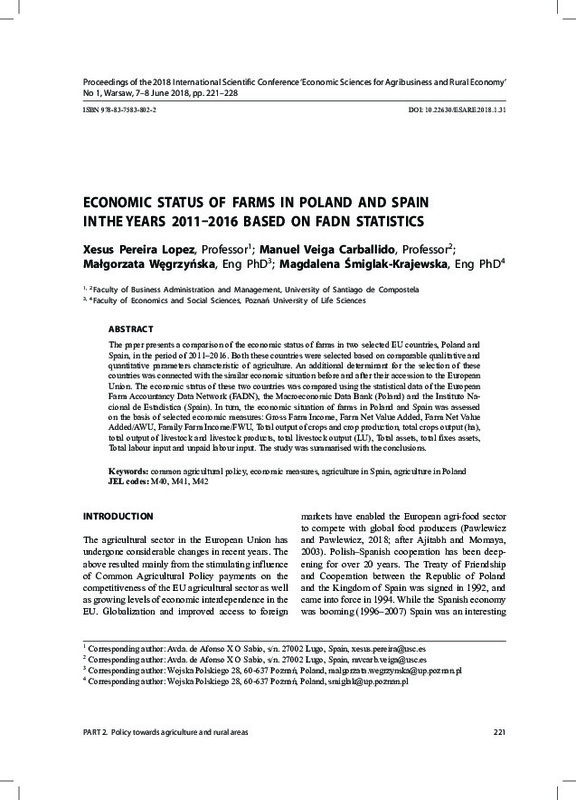 The paper presents a comparison of the economic status of farms in two selected EU countries, Poland and Spain, in the period of 2011–2016. Both these countries were selected based on comparable qualitative and quantitative parameters characteristic of agriculture. An additional determinant for the selection of these countries was connected with the similar economic situation before and after their accession to the European Union. The economic status of these two countries was compared using the statistical data of the European Farm Accountancy Data Network (FADN), the Macroeconomic Data Bank (Poland) and the Instituto Nacional de Estadistica (Spain). In turn, the economic situation of farms in Poland and Spain was assessed on the basis of selected economic measures: Gross Farm Income, Farm Net Value Added, Farm Net Value Added/AWU, Family Farm Income/FWU, Total output of crops and crop production, total crops output (ha), total output of livestock and livestock products, total livestock output (LU), Total assets, total fixes assets, Total labour input and unpaid labour input. The study was summarised with the conclusions. Ajitabh, A., Momaya, K.S. (2003). Competitiveness of Firms: Review of Theory, Frameworks and Models. Singapore Management Review, 26 (1), pp. 45-61. Bieluk, J. et al. (2012). Z zagadnień prawa rolnego, cywilnego i samorządu terytorialnego [Problems in agrarian, civil and local goverment laws]. Wydawnictwo Temida 2, Białystok. Carballido Veiga, M. (2013). Metodos para la valoracion contable de activos biologicos en empresas agrarias [Methods for the accounting valuation of biological biological assets in agrarian companies]. Doctoral Thesis, Instituto de Estudios e Desenvolvimiento de Galicia Universidad de Santiago de Compostela, Lugo. Czyżewski, A., Kryszak, Ł. (2015). Sytuacja dochodowa gospodarstw rolniczych w krajach UE-15 i w Polsce w latach 2007–2013 w świetle statystyki FADN [Income situation of agricultural holdings in EU-15 member states and Poland in the years 2007–2013 in the light of the FADN statistic]. Zeszyty Naukowe SGGW w Warszawie. Problemy Rolnictwa Światowego, 15 (30), 1, pp. 21-32. GUS (2018). Rocznik Statystyczny Rolnictwa 2017 [Statistical Yearbook of Agriculture 2017]. Dział Wydawnictw Statystycznych GUS, Warszawa. Kapusta, F. (2014). Zasoby i nakłady pracy w rolnictwie polskim [Capital and labour resources in Polish agriculture].Roczniki Naukowe SERiA, 16 (1), pp. 91-97. Karwat-Woźniak, B. (2009). Zatrudnienie w rolnictwie indywidualnym w okresie transformacji i integracji europejskiej [Employment in individual agriculture in the period of transition and European integration]. Journal of Agribusiness and Rural Development, 3 (13), pp. 73-81. Klepacki, B. (2005). Tendencje zmian w ekonomicznej i społecznej strukturze wsi 2005. Tendencje zmian w ekonomicznej i społecznej strukturze wsi [Trends for changes in the economic and social structure of rural communities]. In: Wilkin, J. (ed.) Polska wieś 2025. Wizja rozwoju [Polish rural community 2025. Vision of development]. IRWiR PAN, Warszawa, pp. 85-89. Molle, W. (2016). The Economics of European Integration. Theory, Practice, Policy. Routledge, London. Pawlewicz, A., Pawlewicz, K. (2018). Regional differences in agricultural production potential in the European Union member states. In: Proceedings of the 2018 International conference ‘Economic Science for Rural Development’ 47, Jelgava, 09.05.2018, pp. 483-489. Perez-Mendez, J.A. (1992). Contabilidad y Gestion de la empresa ganadera. Analisis del sector ganadero asturiano [Accounting and Management of the livestock company. Analysis of the Asturian livestock sector]. Doctoral Thesis, Departamento de Administración de empresas y Contabilidad, Universidad de Oviedo, Oviedo. Treaty establishing the European economic community. OJ C 325 of 24.12.2002. Wieliczko, B. (2013). Państwo a rynek w rolnictwie – rolnictwo Polski i UE w pierwszych dekadach XXI wieku [The state and the market in agriculture – Polish agriculture and the EU in the first decades of the 21st century]. In: Czyżewski, A., Klepacki, B. (eds.) Problemy rozwoju rolnictwa i gospodarki żywnościowej w pierwszej dekadzie członkostwa Polski w Unii Europejskiej [Problems of agriculture development and food economy in the first decade of Poland’s membership in the European Union]. Polskie Towarzystwo Ekonomiczne, Warszawa 2015, pp. 154-165. Zawalińska, K., Majewski, E., Wąs, A. (2015). Długookresowe zmiany w dochodach z polskiego rolnictwa na tle krajów Unii Europejskiej [Long-term changes in the incomes of the Polish agriculture compared to the European Union countries]. Roczniki Naukowe SERiA, 17 (6), p. 353.